It’s Friday! I’m so looking forward to the working session that I have planned this weekend with my homey – we’re combining our powers (a la Captain Planet) & coming up with some new & exciting ideas to execute next year. I would like to go on record as saying that I love the creative & ambitious people God has placed in my life to get things done – you guys ROCK! On top of that – Looper is playing at the Byrd Theatre, which means I get to see Joseph Gordon-Levitt for the low price of $1.99 (be still my beating heart). 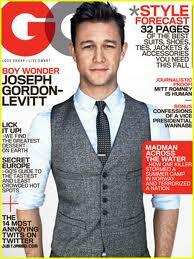 I would like to honor this momentous occasion with a moment of silence, during which I invite you to gaze upon one of my fav JGL covers…..
Isn’t he a cutie? So yeah, needless to say I’m expecting this weekend to be great in more ways than one 🙂 If you’re looking for fun things to do in and around the city of Richmond – here’s some suggestions. Enjoy your weekend! !